Submitted by mahoney on Fri, 08/08/2008 - 1:20pm. Shell Gas Stations USA Including Alaska And Hawaii...Shell Oil Company is the United States-based affiliate of Royal Dutch Shell, a multinational oil company ("oil major") of Anglo Dutch origins, which is amongst the largest oil companies in the world. Shell products include oils, fuels, and card services as well as exploration, production, and refining of petroleum products. The Shell Oil Refinery in Martinez, California, the first Shell refinery in the United States. Completed the update of the file using the website locator. The file now indicates the locations, both USA and Canada, that have diesel fuel. Net increase of 350 locations. If anyone knows of missing locations, please send them to me. I am presently updating the entire file using the Shell website locator. The major problem with the updating is that the website locator listing Only incudes the street address. In order to obtain the City, State , Phone numbers and whether it has diesel, is to use the coord/street address to obtain this information. This is very time consuming and if anyone would like to volunteer for some of the new locations, it would be greatly appreciated. The location at 4077 SR 122, Franklin,OH is no longer a Shell station. Completed the update with help from Seapup. Results: Added 864 new locations, Deleted 976 locations and corrected 57 addresses. Completed the update of the Canadian locations in the file. Added 184 locations and deleted 89. Added a new location in Belleville,ON. Submitted a new location in Newcastle,ON. Corrected the coord for the location at 3550 Queen St East Humberwest Pkwy, Brampton,ON L6P 3L2. I corrected the coord for tha location in Valleyview,AB and also for the 2nd location in Fort Vallay,GA. In addition to macleadv, I corrected coordinates on 24 locations which were indicating duplicates. Submitted a number of corrections to coordinates and also 1 delete. Submitted correct coord for the location in Elko,Ga. Submitted correct coord for the location in Perth,ON and noted that the location in Napanee,ON had closed. Updated the USA portion of the file. Net decrease of 609 locations. Added new locations in Bountiful,UT and Roy,UT. Submitted a new location in Clearfield,UT. Submitted correct coordinates for the location in Napanee,ON. Completed the update of all locations listed on the website locator. Location at 1301 St Rt 123 & 71, Lebanon,OH 45036 Is now a Marathon station. The note regarding the removal of the location in Lebanon,OH should have been against the BP file. Completed the update of all Canadian locations. Submitted a new location in Barry's Bay,ON. Submitted corrected address and coordinates for the location at 355 Waverley Road, Bowmanville,ON L1C 3L1. Submitted the location in Clearfield,UT is not a Shell station. Corrected the coordinates for the location at 460 East SR 50, Titusville,FL. Submitted corrected coordinates for the location at 4193 Hamilton Cleves Rd, Hamilton,OH 45014-5907. Compared all US listed locations to the website locator. Submitted a new location in Loveland,OH. Submitted coordinate changes for 2 locations in Calgary,AB and for the location in Osoyoos,BC. Corrected the coordinates for the 2 locations in Mount Dora,FL. Submitted corrected coordinates for the location in Gloucester,ON. Corrected the coordinates for the locations in Peru,IL. Submitted correction to the location in Bancroft,ON. Updated the US portion of the file using the website locator. Net increase of 1069 locations. Submitted new coordinates for the location in Kaladar,ON and submitted a new location in Marmora,ON. Corrected the coordinates for the location in Fernley,NV. Added new locations in Blairmore,AB, Fort Macleod,AB, Lethbridge,AB and Okotoks,AB. The location at 5644 Hwy 3A West,Nelson,BC doesn't exist. Removed from file. Submitted corrected coordinates for a location in Carp,On and Nepean,On. Submitted corrected coordinates for the locations in Cordes Junction,Az and Mount Carmel,Ut. Submitted corrected coordinates for a location in Kilgore,tx. The location mentioned on Jan 16,2013 is being converted to a Chevron station. The location at I-95 Exit 223 [4412 W Main St], Mims,FL is closed for renovation. Submitted corrected coordinates for the location in Versailles,IN. Submitted a new location at 6445 Source Center Point, Colorado Springs,CO 80903. Corrected the coordinates for both locations in White Sulphur Springs,WV. Corrected the coordinates for the location at 2231 W Beverly St, Staunton,VA 24401-2903, (540) 886-8449. Corrected the coordinates for both locations in Alma,AR. Submitted corrected coordinates for the location at 9210 Cincinnati Columbus Rd, West Chester,OH. Submitted new location at 2843 E 53rd, Davenport,IA and corrected the coordinates for the location on Kimberly rd. The location at 1325 Richmond Rd, Ottawa,ON K2C 3P1 has closed. Added 431 Canadian locations. NOTE; The Canadian portion of the file now indicates the locations that have Diesel. Submitted multiple new locations and corrected coordinates for the Canadian portion of the file. Net increase for the changes made on 2/11 was 867 locations. Updated TX. Net increase of 1396 locations. Updated TN. Net increase of 409 locations. Updated AK, AR and CT, Net increase of 235 locations. Update of SD was also incuded in the latest file update. Added 3 locations in Ga, 2 in Mo and 2 in Ok.
Added 4 NC locations: Charlotte, Maxton, Wadesboro and Waxton. Updated DC, DE, NC, NE, NH and NV. Net increase of 523 locations. Updated MA, MD, ME, and MI. Net increase of 554 locations. Updated the Louisiana listing. Net increase of 287 locations. Added 8 Kansas locations and 3 Illinois locations. Submitted an updated listing of the locations in Missouri, Net increase of 156 locations. Noted that 14 Kansas City and 1 Indepencence location should be in MO, Not KS. Included new coordinates. Completed Illinois, Indiana, Kansas and Kentucky. Net increase of 634 locations. Completed Georgia,Hiawaii, Iowa and Idaho. Net increase of 622 locations. 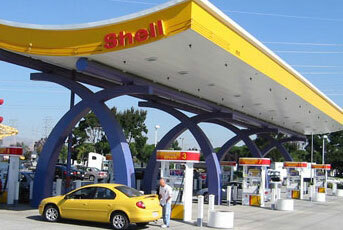 Noted: The location in Layton,UT is no longer Shell, It has been converted to a Chevron. Added 4 UT locations: Salt Lake City, Lake Point, West Bountiful and Layton. Added 15 UT locations: Wendover, St George(3), Hurricane, Beaver, Cedar City(3), Moab(3), Thompson, Monticello and Sandy. Added 53 NV locations: Boulder, Henderson (7), Las Vegas (38), North Las Vegas (7). Added 10 locations in NV: Wells, Spring Creek, Elko (2), ElY (3), Austin, Hawthorne and Tonopah. Added 7 locations in NV: Minden, Yerington, Lovelock, Winnemucca, Orovada, Valmy and Battle Mountain. Noted that the location at 1091 Hyland Blvd, Staten Island,NY has closed. Added 11 locations along I-95 interstate in Florida between Exit 210 and the FL/GA state line. Added 3 locations in Warner Robins,Ga. Google earth was used to obtain the coordinates. Added location in Perry,Ga and included the interstate exit number in col D. Google earth was used to obtain the coordinates. Corrected coordinates on Winfield, AL location. Added 1 new Richmond, MO location. Corrected coordinates on Phillipsburg, NJ location. Added 1 PA location, and corrected coordinates on another.